SPARTANBURG, S.C. -- In the comic book world, Doctor Octopus manipulates four tentaclelike metallic arms to fight Spider-Man, and Iron Man Tony Stark dons a high-tech suit to gain super strength. Now the characters have inspired real-world auto manufacturing. At BMW's auto plant here, assembly planner Frank Pochiro hopes to introduce the "ekso vest," a backpack-style device that helps reduce muscular strain of shop workers performing overhead work. The vest is a wearable exoskeletal tool created by Ekso Bionics of Richmond, Calif. It uses no power, but provides ergonomic upper body and arm support that makes objects seemingly weightless and enables a worker to operate in a factory line posture without fatigue. 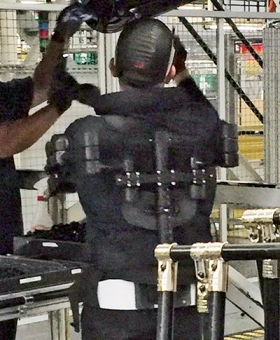 Bavarian premium car rival Audi also has started using exoskeletal systems to support tired workers' posture. Audi's solution is a wearable carbon-fiber "chairless chair" that lets line workers relax into a modified sitting position as they stand on the line. "I used to think we really could use an Iron Man suit," Pochiro says. "And when I saw exoskeletons on a TED Talk, I got management approval to start a pilot program." Designing an ergonomically optimized assembly line can provide a competitive edge by enhancing worker productivity, especially as work forces get older. Pochiro says workers who tried the vest don't want to go back. BMW expects that all relevant employees will have their own, to avoid any hygiene issues of sharing. "We've run trials on 30 employees and they really love it," Pochiro says, adding that he is evaluating prototypes from two U.S. companies. Eventually the devices could be worn by BMW workers from Germany to China for a variety of jobs. Pochiro believes more supportive battery-powered exoskeletons will arrive in the years ahead. "Safety is improved, there is less fatigue, and job satisfaction goes up," he says. "So we see lots of potential."